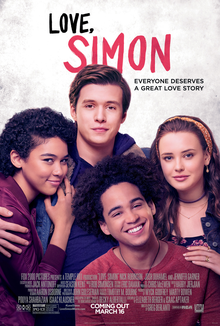 This entry was posted on Friday, March 23, 2018 and is filed under Family Drama,Friday Flicks,LGBT,Love Simon,Movie Review. You can follow any responses to this entry through the RSS 2.0. You can leave a response. I am going to see this with my sister tomorrow. I hope I like it, because I loved the book. My other co-bloggers were not dazzled (they feel as though they are the only ones in the YA blogosphere to think negatively about it), but I feel like I will. I mean, John Hughes films shaped my teen years. There were definitely some changes from the book, but it still captured what made me love the book so much!